And we all think that we know the reasons. We see the rise of social media and MMS/SMS as equivalents to what happened to the letter form in the mid to late 1990s. In retrospect what happened then seems to have been compressed into a very short time. One minute I was a regular desk worker, with a dictation machine and a secretary, and the right to spend a week deliberating before responding to an idea or an invitation. In an instant all that morphed into a world where response had to be, at most, within the day, though communication could be shorter and less formal. Much wider groups could be co-opted into the ongoing discussion. I now needed to become a two fingered keyboarder. And changing skills meant changing etiquette. I had just asked whether I needed to have two email addresses – one for public and one for private correspondence – when the roof fell in and everyone reached everyone with everything everywhere – including sending so much unwanted advertising matter in one form or another that it was easy to predict that this alone would bring email systems groaning to a halt. * Corporate email, internal and private and housed inside enterprize operating systems, makes a comeback. External clients and associates can be co-oped into these circles, temporarily or permanently. * Corporate users at last discover why they created a corporate Wiki, which has been standing all unused for five years. * Social media applications like LinkedIn or Yammer (micro-blogging for corporate users: www.yammer.com) will handle a great deal of outbound corporate messaging as web-based email continues to decline, and orkers seek to diminish the time-wasting capacity of email. * The largest increase in communications will be M2M (machine to machine), as sensors drop below $10 each and all of our gadgets start reporting that they need servicing, or fuel, or that they are too hot or cold, or we are almost out of milk. * Amongst consumers, Facebook and IM take up the slack, as even less formal and even shorter communication modes become essential. * Voice drives many of these applications, either via voicemail or through voice to text service environments. * Most personal communications will be mobile device originated and received. 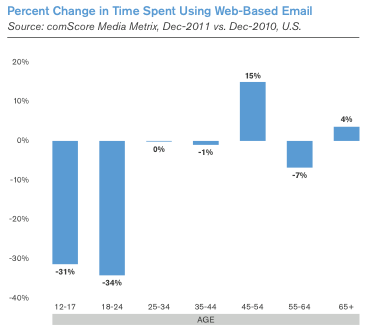 Within two years, if comScore is correct, those of us who have to send a seventeen year old a text and a voice mail asking him to read his email will be ceasing to bother with the longform communication at all, and in five years email will be an important, but minority, expression of the need to communicate. Looking back, we shall say that we went in this direction in order to realize a need for privacy, but that was only a part of the question. In fact, email overwhelmed us. It became the excuse not to work, instead of a part of work itself. And as soon as it became the focus of unsolicited advertising, its days were inevitably numbered. Far from the future being inexorably web-based, we now perceive that many functions that we rely upon will retreat to the internet or the mobile network: interpersonal communications will lead the way. So is this really another “death of advertising” piece in disguise? As online advertising share of market continues to grow, and as online sales show impressive annual growth it would seem perverse to take this line. Yet privacy, in currently proposed legislation on both sides of the Atlantic, seems like a political crowd pleaser. And behind it lies another urge, which is not just to control and defend one’s own information, but to be able to trade that information to the highest bidder in return for perceived or sought after privileges. Seeing the founder of Paoga (www.paoga.com) across a crowded room last week reminds me that there have been visionary attempts to do that for some time, so this email decline triggers their powerful emergence. We then create a permissive society of a different type, where we have allowed a marketeer whose goods we seek to message us in return for discounts, coupons or other advantages, and in a context where that privilege can be removed rather more decisively than the current rigmarole unleashed on email users when they hit “unsubscribe”. Social marketing takes up the pace from wasteful and intrusive email blanket bombing. For a time we get back into balance – though no doubt we soon overbalance again in new and unpredictable ways. Yammer is now used in 100,000 US corporations. Emails are still not admissable in much litigation in UK courts. The speed of change is now so fast that we do not get to fully move into something before we begin move out of it. And, alas, as soon as we migrate our communications elsewhere, Mr Murdoch will probably employ someone to find a new way of hacking into them. Eventually, we shall reach Venusian mind transfer (aka thought driven computing) and StarTrek will return to high fashion. In five years we will describe email with the same nostalgia now reserved for letter post.